Does the lure of your credit card ever compel you to go on a shopping spree, just because you can – at least until the bill comes – spend more money than you actually have? The answer may depend on your gender. Nearly three-quarters (74.9%) of total respondents to a recent CreditDonkey.com survey said they have never gone on a shopping spree simply because they have a credit card. However, 30.7% of the females in our survey admitted a credit card has inspired them to go a spree. 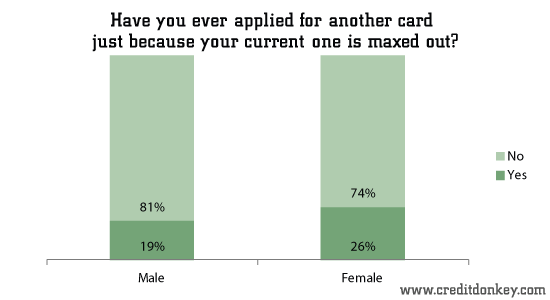 The survey revealed other tidbits about perceptions of credit cards along gender lines as well. Overwhelmingly, when asked if they had applied for a credit card solely because another one is maxed out, 77.7% of all respondents said no. However, women were slightly more likely to do so. •	54.3% either pay a little more, pay a lot more or pay the balance in full every month. •	33% do not have or use a credit card at all. 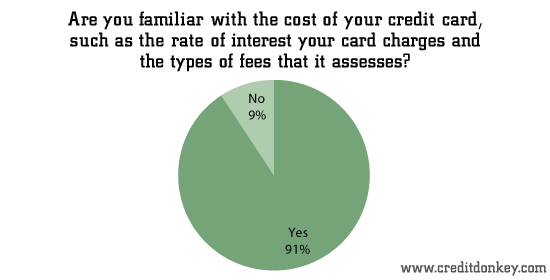 And the majority (90.7%) of respondents is fully aware of how much their credit cards cost them. Costs of using a credit card include the interest rate charged on balances as well as fees, such as the annual fee, late payment fee, and the fee charged when cardholders go over their stated limit. Proper use of credit cards involves knowing how your card works, including keeping track of due dates and the grace period allowed before interest is charged. The best way to use credit cards is to pay off the balance in full each month, as 24% of our respondents do. This way you can earn card rewards but avoid carrying a balance plus interest charges that build up debt. Share on Facebook "Survey: Credit Cards Don't Cause Shopping Sprees"